The dog needs enough room to be able to turn around and approach with a straight spine. Commence with the dog in front. Keep the right foot anchored. Step out to the side with the left leg as far as is comfortable and with the left hand lure / guide the dog in a straight line out to and beyond the left foot. When the dog is beyond the left foot, turn the dog in towards you. 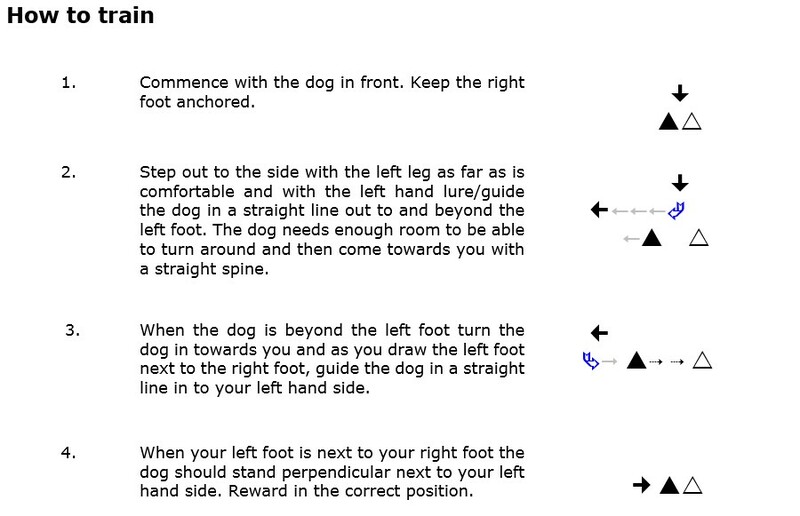 As you draw the left foot next to the right foot, guide the dog in a straight line in to your left hand side. When your left foot is next to your right foot the dog should stand perpendicular next to your left hand side. Reward in the correct position. Over time, the handler will not need to step so far to the left as the dog will be doing more of the work. 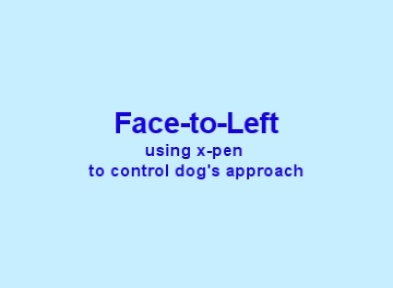 The end result of this, is that on the face-to-left cue from the front position the dog will come around and place himself perpendicular to your left hand side. This position should also be taught with the dog commencing from the right hand side, behind you and from left hand heel position.